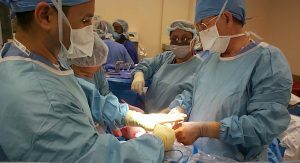 Every year, hundreds of thousands of patients undergo surgery at one of the nation’s rapidly proliferating surgical centers (estimated to be somewhere between 5,600 to 7,000). In fact, these centers now surpass the number of hospitals, as U.S. regulators trying to lower health costs are green-lighting an expanding number of outpatient procedures. However, according to a new in-depth report from Kaiser Health News and USA Today, these centers are too often are ill-equipped to handle emergency complications. As a result, hundreds of patients have died as a result of “routine” surgeries, such as tonsillectomies and colonscopies. No knows exactly how many deaths, illnesses and injuries happen at these centers because no one is required to keep track. Although any surgery carries a risk and some centers boast top-of-the-line medical equipment and well-trained staffers, journalists uncovered dozens of cases where a lack of training or basic equipment found at most hospitals made a difference in patient outcomes. Increasingly, facilities are taking on surgeries deemed very risky, including spinal operations. Still, there is incentive for many doctors because they often own a share of the center and can collect a facility fee along with their own fee. Although Medicare requires surgical centers have partnerships with local hospitals to arrange for transport in the event of an emergency, that can still be 20 to 30 minutes of wait time in some areas. High risk health problems (high blood pressure, sleep apnea, etc.) are sometimes overlooked by surgical centers. Some centers have been accused of sending patients home before they are ready or sufficiently recovered to be released from medical monitoring, with family members realizing on the way home – sometimes too late – that their loved one wasn’t just asleep but nearly dead. Plaintiffs in South Florida medical malpractice lawsuits against these surgical facilities allege that if patients had been properly monitored for longer – at least overnight, and preferably in a hospital – such serious problems may not have arisen. Or if complications did crop up, they would not have proven fatal had patients received adequate care. The News-Press reported two patients at a south Fort Myers clinic claimed in separate medical negligence lawsuits recently that physicians sent them on their way home after mistakes during cosmetic surgery, even when medical staff hadn’t fully revived them from their anesthesia-induced unconsciousness before they left. Florida has had at least 335 life-threatening “adverse” medical events since 2013 at these surgical facilities, sometimes referred to as “ambulatory” surgical centers. Eighty of those incidents were fatal. Now, lawmakers in Florida are considering a bill that would allow even greater use of these centers and create a totally new class of centers – “recovery care centers” – that would give them the opportunity to take on even more high-risk patients and procedures. The concern is there isn’t enough government oversight, or even framework for that oversight, to make sure serious incidents are well-documented and that problem facilities are held accountable. Although hospitals face constant – and public – quality score assessments, these kind of “day surgery” centers don’t draw the same kind of scrutiny. Poor outcomes don’t automatically mean medical negligence was the cause, but it’s worth carefully exploring with an attorney with experience and a track record of proven success in these cases. Contact the South Florida wrongful death attorneys at Halberg & Fogg PLLC., Attorneys at Law, by calling toll-free at 1-877-425-2374. Serving West Palm Beach, Miami, Tampa, Orlando and Fort Myers/ Naples. There is no fee unless you win.